It is indeed surreal sometimes-how something stares you in the face-blatantly, clear as day and yet ignorance in all its wondrous effectiveness shields it from plain sight. The signs are always there, the voices speak constantly-the loudest one being that of the conscience, which I have grown to believe, is the ‘spirit of the soul’ so to speak. The signs light up like neon every now and then, brighter and brighter with each passing year of ignorant pleasure living. The voices grow louder and louder till they boom away like jungle drums in the dense and convoluted jungles of the mind. They increase in intensity, but we choose to turn away from the signs, snuff out the voices and forge ahead, even as we rise in pig headedness and tomfoolery, servants to the Mayic wonder and slaves to the five senses-not even acknowledging the presence of the sixth. And then they stop. The signs wither away and crumble to dust. The neon lights become fainter and fainter till they’re indistinguishable from the darkness they once lit up. And the voices….the voices fade away into an inner sanctum which even Maya cannot penetrate. And suddenly the sound of silence envelops you, as the all encapsulating darkness lights up the dream path to self destruction that you have chosen to tread. You rejoice as you walk along the said path undeterred and ‘uncompromised’. You service your senses and live for the moment. After all, what else is there to live for but the moment, right? Yesterday is long gone and tomorrow is too far away. What good comes of mulling over the past and wondering about the future when you have a perfectly livable NOW? If only time was that amiable a friend. Actually, it would be wrong to judge time. It in no way judges us. It only accompanies us on our various journeys and whether it turns out to be a friend or foe, is actually very much what we make of it. If you want to know what got me pondering over what some would call ‘abstract notions’ such as these, it actually has to do with some very personal bitter experiences I have had the good fortune to encounter recently. The experience surprisingly coincided with a conversation with a very close friend. This friend of mine is a commodities trader by profession. He buys stuff from international markets and sells them at higher prices in India AND MAKES A TON OF MONEY IN THE PROCESS. But of course, life has not been all hunky dory for him. In fact our recent conversation was actually about the difficult situations life has been handing him lately. With a mother, father and 87 year old grandmother, all of whom have taken ill suddenly in the past few days, my malaria-stricken friend has also been incapacitated enough to not be able to handle everything. “I will recover with time, but what I see in my parents scares me,” he tells me. “If only they had taken care of their bodies and minds in their youth, they would have had such a healthier and happier old age.” If only they had listened to those voices before the silence and taken heed of the flashing neon signs before they faded away into oblivion. If only. Of course, there are chain smokers who go through life lit up and yet die safe in their beds, healthy and happy at the ripe old age of 99. And I have also known people who have led strictly disciplined, vegetarian, exercised, meditated, moderate, smoke, alchohol and stress-free lives, only ending up developing terminal cancer at the ridiculously young age of 40. And of course, one can’t rule out freak accidents which take a shot at pretty much anyone from the ages of 2-80. Karma takes the upper hand. There are no punishments or rewards-only consequences. And so it goes on and on till liberation from the Mayic cycle is achieved. But as a general rule, listening to the voices and taking heed of the signs helps. And that, I can safely say, is a proven fact. So my friend and I concluded that it’s time we started acknowledging the voices and the signs, which thankfully are still quite vivid-yet. He has agreed to quit his drinking binges, make his work more stress-free, exercise and meditate. And I have made promised to myself to get my life back-my health, my emotions and my peace of mind and soul. And I intend to do that with proper eating, exercise, writing a lot, spending time with my family but more with myself and God and being mentally and physically active and above all, to be true to the spiritual path that I follow and all will be well. Ultimately, my only solace lies in God. My Guru came to me one day many years ago with that flashing sign and his voice spoke to me through so many others devotees who have followed his teachings and found the bliss that awaits me too someday. He was the light at the end of the long dark tunnel that I was travelling through blindly and aimlessly. It was a flame burning bright actually, and when one finds such glorious light, one may attempt to douse it with ego consciousness over and over again-as I and many others (I’m sure) have done on the path. But the burning spark persists. My Guru has promised to never give up on me-even though I have strayed not one, but multiple times. And one day, you realize that the flame is the real deal and the darkness and the ego and the tunnel are all a dream. And then you taste the fire, savor it and nurture it till one day it becomes a roaring raging fire of God-conscious bliss and when it consumes you completely, there is no turning back. 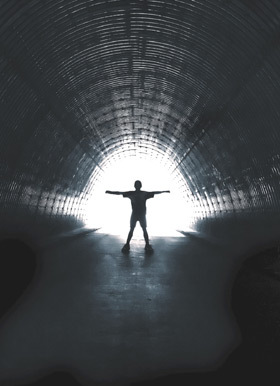 I am aware of the light at the end of the tunnel. I have passed through the tunnel and as predicted, I, veiled with ego consciousness and attachment to worldly attributes, have attempted to sometimes ignore and sometimes extinguish the flame altogether. But it seems to burn brighter than before. The time has come to acknowledge it and grow with it and I await the day, when the flame becomes a raging fire and the fire and I are one.